South Korean actor Ha Jung-woo can not only make faces, but also paint them. The versatile man loved for his impressive filmography, made up of mostly thrillers and action flicks like “The Chaser,” “Take-off,” “War against Crime” and also the latest mega-hit romantic comedy “Love Fiction,” is gaining reputation as a talented artist among art insiders. Jointly organized by the carmaker and Pyo Gallery, the exhibition showcases about 20 of the actor-artist’s paintings, including some of his 2012 works that were shown to the public for the first time. “Life as an actor is like living through an invisible war. Paintings soothe me and make me rational. It is too extravagant to say that painting is my hobby; it is rather a way for me to survive as an actor,” said Ha during a talk held as a part of the opening ceremony of his show. His father, veteran actor Kim Yong-geon, sat by him during the ceremony. Ha said that he started to paint one day, about 10 years ago, when he abruptly went out and bought a sketchbook and a 4B pencil. Living an irregular life as an actor ― which he referred to as a “non-permanent employment status” ― he wanted to rely on something, he said. “Now it is a part of my life. I have no TV in my living room, but an atelier instead. I don’t make time to paint but just paint as I come and go,” he said. The vivid colors and bold brush strokes commonly found in his work seem to reflect the actor’s unhindered character, or at least what we see in him through his films. Looking closely at the seemingly roughly painted faces, though, viewers may be amazed by the depth of expressions and sentiments at which each one hints. The faces perfectly match their titles: “Mr. Lonely” seems so alone, “Just Laughed” so happy and “Brave Heart” so courageous. “I painted many things at first; flowers, trees and jars. But last year, while preparing for an exhibition, I started to wonder what it was that I knew best, was most curious about and could best express. Blank faces popped up in my head. It must have something to do with how I create characters as an actor and my interest in human expressions,” said Ha. He named Pablo Picasso, Henri Matisse, Bernard Buffet and Jackson Pollock as some of the great artists who inspired him, as well as Clint Eastwood, in terms of acting. 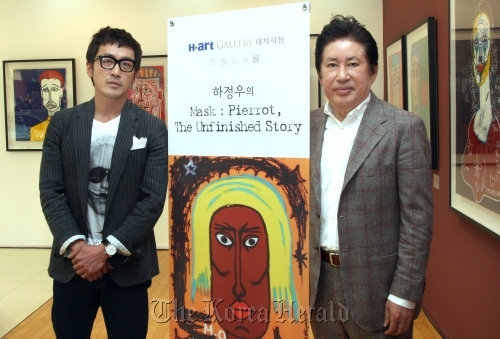 Pyo Mi-seon, head of Pyo Gallery, commented that Ha’s works are very pop. 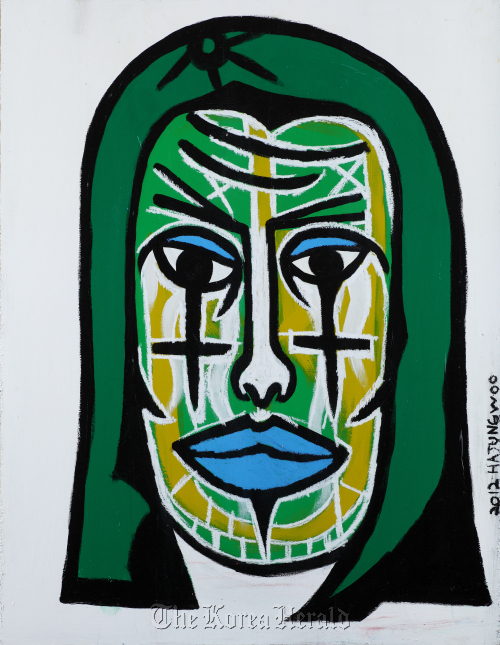 “We could put his works in the Expressionism category influenced by Germany. There are many actors who paint these days, but those who can actually paint like this are very rare,” commented Pyo. The exhibition runs through Aug. 16 at H-art Gallery in Daechi-dong, southern Seoul. For more information, call (02) 564-0365.